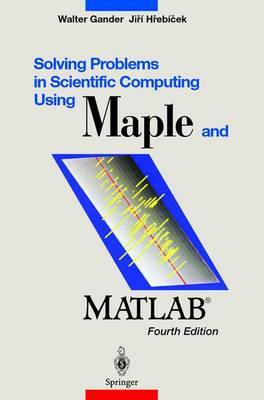 Teaches problem-solving using two of the most important mathematical software packages: Maple and MATLAB. This new edition contains five completely new chapters covering new developments. "... The idea to present mathematical modeling, numerical algorithms, and their implementation as cornerstones of scientifc computing is accomplished in a unique way. This book constitutes a valuable source of topics, problems, and methods for the teacher who wants to teach numerical algorithms in a project oriented style. For beginners or even experienced users in computational science the book is an excellent entry point to the world of high and mathematical tools beyond the introductory textbook level." ".. An excellent reference on undergraduate mathematical computing." American Mathematical Monthly; "... manuals for such systems (Maple and MATLAB) tend to use trivial examples, making it difficult for new users of such systems to quickly apply their power to real problems. The authors have written a good book to address this need. ... the book is worth buying if you want guidance in applying Maple and MATLAB to problems in the workplace..."
".. The presentation is unique, and extremely interesting. I was thrilled to read this text, and to learn the powerful problem-solving skills presented by these authors. I recommend the text highly, as a learning experience, not only to engineering students, but also to anyone interested in computation." "[...] The book is intended primarily for students of engineering and scientific computing but it can be useful also for students in physics, chemistry, biology, mathematics, computer science, statistics and economy. It can be highly recommended as a support for all who are studying or teaching mathematical modelling and numerical methods and is interested in modern computation." "The book aims at teachers and students in mathematics, sciences, and engineering ... . The idea to present mathematical modeling, numerical algorithms, and their implementation as cornerstones of scientific computing is accomplished in a unique way. This book constitutes a valuable source of topics, problems, and methods for the teacher ... . For beginners or even experienced users in computational science the book is an excellent entry point to the world of high end mathematical tools beyond the introductory textbook level."